PanARMENIAN.Net - -The [Nagorno Karabakh] conflict has a solution but each side holds negotiations in a way to gain more advantages. At the beginning, there were a lot of rifts but currently there are just a couple provisions the sides can’t agree upon. -Recognition of Artsakh’s independence is not up to Azerbaijan. The status of the republic will be determined in the framework of the OSCE Minsk Group. The problem has not been resolved so far, because the international community didn’t push for it. There are new circumstances which inspire optimism for a soonest solution of the conflict. -If Armenia says it’s ready to sign the document, Azerbaijan will have no choice. However, Armenia never expressed willingness to do so. -The proposals on the table are the least evil. If we don’t accept this one, the next one will be much worse. - Artsakh’s reengagement in the negotiation process is not envisaged yet, although the mediators have several times mentioned such a possibility. I know when it will happen but will not detail it now. -We can call these territories liberated, historical, sacred and so on; however, the international law doesn’t recognize such wording. We can say “we have liberated them”, but the international community calls it just “occupation”. -We don’t have a problem with Azerbaijan. We are two conflicting parties, who addressed to the international organizations for a problem solution. Thus, whatever decision these organizations make, Azerbaijan and Armenia will have to accept it. -Azerbaijan understands that the countries which sign the agreement will become the guarantors of its implementation. 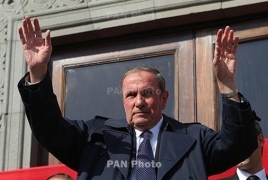 If there are violations regarding the territories of NKR and Lachin, Armenia will have the right to interfere. -The people of Armenia must urge the authorities to resolve this problem. The elected power is obliged to out an end to people’s suffering. -We say we are ready [to accept the OSCE MG proposals], but as a matter of fact, it’s the Republican Party, who is ready. The others have no idea. If a political force doesn’t offer concrete steps to be taken towards the conflict resolution, I would advise the citizens against voting for them, because if this problem is not settled, the other pledges don’t matter.